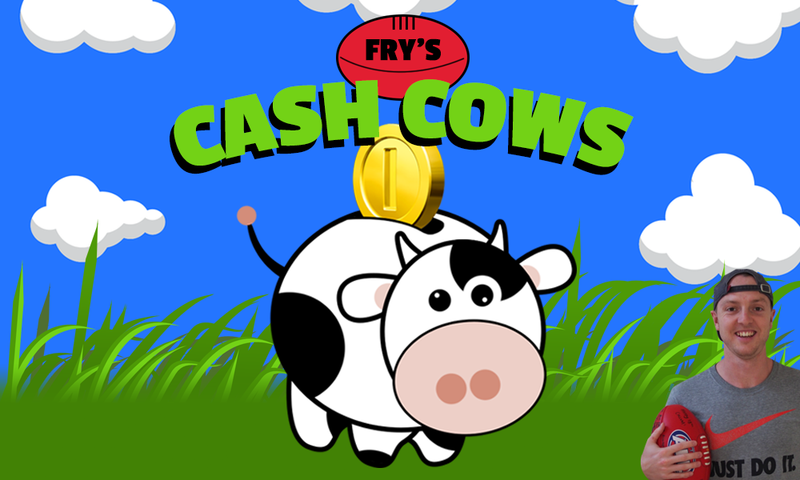 Fry uses a bigger sample size to break down all the must-have cash cows to help you get the right rookies into your team before it’s too late! A week is a long time in fantasy football, just ask those of us who fielded Bailey Scott. No extra points could be found from the app glitches for the Round 1 hero as the must-have rookies are starting to take shape. This is the week to nail those top cash cow talents before they inflate too much more in price and you miss the boat entirely. The SANFL is the only second-tier league in action at the moment, so there’s no a lot of relevant news. However, there is one towering Crow who’s making waves recently and only more names will start to filter through as the reserve level seasons kick off. In case you missed my pre-season rookie guide you can visit it here. With a bit of a different format to cash cow bibles of the past here’s a guide to understanding the article before you dive into all the numbers. Get ‘Em: These are the players you MUST have in your team. For whatever reason – job security, scoring potential, price, or a combination of all three – don’t mess around and make these rooks/cash cows a priority. Watch ‘Em: These aren’t quite must have’s nor should you ditch them ASAP. Rather, the youngsters in this bracket need to be monitored, whether they are in your team or not. Drop ‘Em: Speaks for itself. Ditch these players who are at risk of losing money/their place in the side. On The Outside Looking In: Players who weren’t on the park last weekend, but need to be looked at. A portion of these players will become future trade targets. *For those who are unaware a player’s breakeven is the score they must reach to maintain their current price. Already showcasing fantasy tendencies, there’s a lot to like about Jordan Clark. A late goal for the young Cat changed his score slightly, but even without that +9, he put forward a 50 point second half to salvage his score. The buzz around Zach Tuohy taking is spot is starting to die down slightly, which is only more good news for owners. Tom Hawkins is looking after the young Cats! After a week on the watchlist, Scrimshaw has elevated himself into the next category. Not only did he increase his score by a good 20 points in Round 2, but he increased his TOG percentage (70%-81%). Here’s to hoping both his scoring and his game time can keep ascending. Take a bow young fella! The first fantasy ton from a rookie came via a 23 touch, nine mark performance from Duursma, who is quickly making a name for himself as the best defensive cash cow. Given his ceiling and DPP status, I think he’s the No. 1 rookie trade target ahead of Round 3. Yeah, I said it. I might have been wrong about Connor Rozee. Two goals in quick succession against Carlton showed us why the Power spent pick No. 5 on the talented SA product and another good score on the weekend has a lot of coaches considering him before his price rises too high. I’m waiting to see what type of scores he can produce when Port Adelaide include some bigger names, but by then I may have missed the boat. Not my cup of tea, but he’s certainly worth a look. Now THAT was the Sam Collins those of us who took a pre-season punt all expected to see. He removed himself from the doghouse with an 18 disposal, eight mark display where his intercept marking ability was on clear display. As I said last week I wouldn’t go fielding him, but he still has room to grow on our benches. I had high hopes for Wilkie, but after what he dished up on the weekend I’m not so sure. He has only managed two 40’s in two St Kilda wins, so maybe if the ball is closer to their backline he might showcase his talents. However, there’s every chance he isn’t given a chance to prove that in Round 3 should the axe swing down on him. The most popular defensive rookie rewarded owners for their patience on the weekend against Freo. Half a dozen marks was a good sign from one of last week’s whipping boys and while he isn’t worth starting on your field he can make us some more money. His handy FWD/DWF status makes him worth holding onto to help with trade flexibility. This might be a tad premature, but Ben McKay seems to have almost topped out in price. With a ceiling under 50 in his brief career to date, he could respond and top the half ton this week. However, almost all of the players mentioned above are high on the pecking order than him and I would consider adding one of them if I had the luxury. Noah Balta 2.0? I’ll talk about the pre-season hyped Tiger later, but Markov was someone that nearly 7% of coaches currently own. He didn’t exactly ball out in his first game in over a year, managing just eight touches for the contest. Similar to McKay, even if Markov keeps his spot, which appears unlikely, I’d be looking to ship him out. A pair of popular players to start the season could be back in the mix this week. Jordan Ridley (Bombers, $318K) was a bit unlucky to not hold his spot in Essendon’s side after Round 1 and he appears likely to come straight back into the side that struggled against the Saints. Marty Hore (Demons, $181K) is another one who might be back after a week off, but there’s no certainty. Injuries in the Hawks midfield could pave the way for Harrison Jones (Hawks, $170K) to earn a call-up after impressing with 79 in the first JLT game this preseason. Brandon Zerk-Thatcher (Bombers, $170K) continues to be mentioned as a potential debutant, but similar to last week I think taking a wait and see approach is the smart play. Hooly dooly! Constable has burst onto the scene to start the year putting forth a very noteworthy 80 and backed it up with his first ton of the season. It came in the drubbing of Melbourne, so it would be foolish to expect 31 disposals every game. That being said, he hasn’t put a foot wrong early and 43% of the comp has to do something ASAP to bring him in. Bravo. The chatter around Sam Walsh has quelled, but he should not be overlooked. Two great scores to start the year are what we expected from him and a no-fuss attitude, accumulating his points in a variety of ways is a big reason why he is the most owned player in the game. Sigh. There were plenty of coaches out there hitting refresh on their app and hoping that the Bailey Scott score was still malfunctioning. Unfortunately, the 18-year-old was the only one with problems. After a dream debut, Scott’s nine disposal effort against Brisbane has put him in the firing line, shaping up as a potential Paul Ahern replacement. There are reports that the youngster was suffering from gastro before the game though, so here’s hoping Brad Scott gives him another life. Eight tackles from the former Geelong VFL skipper helped to push his score higher, although his 57 wasn’t exactly a talking point. He did rack up his 12 touches in a variety of places but was a non-factor in other areas. You’d think he’s safe in the side, but Quinton Narkle coming in could see him forced out. Unlikely, but stranger things have happened. Zak Butters is a tough fantasy player to peg down right now. He needed 22 touches for his 69 points on the weekend, however, he is still getting the job done from a cash cow perspective. Our expectations are being lifted by the likes of Walsh and Constable, so there’s nothing wrong with Butters if you’re an owner right now. I’d wait to see how he looks when Wines comes back if I don’t own him, but similarly to Rozee, he may have fattened up significantly by then. A much more encouraging performance from Gibbons last weekend saw a lot of coaches breath a sigh of relief. Nothing is guaranteed, but his electrifying first quarter might force Brendon Bolton to keep him in the side moving forward. Seven disposals, five tackles and 42 fantasy points is a great effort in one period of footy from a cash cow and even though he didn’t go on to a huge score, he’s trending upwards which is a good sign. Alright LDU, you now have our attention. The second-year Roo had the best fantasy game of his career on the weekend as he seemingly starts to piece it all together. Davies-Uniacke’s points were scored all over the place and he’s coming into a lot of coaches thinking right now. I’m not in on him for the Large Fry’s & Coke, but this might be the last chance to get him before he goes up too much in value. Sparrow didn’t really get the job done for the Demons or fantasy coaches against Geelong last weekend. The good news is he’s only sitting in 1% of teams right now, but the bad news is there’s a high likelihood that 1 % of coaches will have a trade to make. At $270K Chayce Jones owners don’t need to panic. There is still time to patch up a gap in your team, by sending Jones packing after a sub-par performance. Don’t wait too long or he’ll start to lose value, which is worrying to say for a player priced so low. If you’re a Bailey Smith owner this is a good example of fixing your rookie mistakes before it’s too late. Another low score doesn’t do the kid’s talents justice, but he is clearly still finding his feet at AFL level coming off his injury. Must trade. The Richmond midfield is a tough rotation to crack, and for that reason, I don’t think we’ll be seeing Jack Ross (Tigers, $170K) anytime soon. However, the youngster continues to impress this time by racking up plenty of the footy in a VFL practice game. Fellow 2018 draftee Rhylee West (MID, $220K) faces an equally tough task getting a gig in the Bulldogs’ engine room and he and Will Hayes (Bulldogs, $170K) will probably have to wait their time before anything comes to fruition. 2017 draftee Patrick Wilson (Crows, $278K) finished his first SANFL game of the season with 28 touches and 117 fantasy points, but it’s tough to see him forcing his way into the Crows outfit…yet. Finally, Corey Wagner (Demons, $196K) may find his way into the side to replace the aforementioned Sparrow and give 8% of the competition a nice bench boost. With Sam Jacobs dealing with a knee knock injury Reilly O’Brien will likely hear his name called as the team sheets are unveiled before the Geelong game. He played in Adelaide’s SANFL game last week and finished on 107 fantasy points in a pretty complete performance that included 17 disposals and 21 hitouts. O’Brien is a bit pricey and hasn’t played in an AFL game since 2016, however, in his two career games to date he dropped a 64 and an 84. I’m not going to take the gamble, but if you’ve got the money and a luxury move he could make you some quick cash while Sauce is out. Beware, Jacobs may very well return in Round 4 given the Crows have a five-day break this week. Much like last week, there isn’t a lot to report with the cheaper rucks at this stage. Archie Smith (Lions, $217K) is still the pick of the ruck rooks in my opinion after being named an emergency against last weekend. Zac Clarke (Bombers, $270K) could come into the mix for an Essendon outfit crying out for production and popular bench choices Darcy Fort (Cats, $170K), Matthew Flynn (Giants, $170K) and Darcy Cameron (Swans, $170K) will be monitored when lower grade games get underway. A lot of us are sweating on how Ollie Wines will impact Willem Drew’s scoring. While this week may finally put that theory to the test, the young gun has shown enough in the first fortnight of the season to warrant a spot in Port’s side. He delivered again against Carlton, featuring in a whopping 91% of the game. Hopefully, he can keep these numbers up even if Wines is running alongside him. I got called out for labelling Parker a key position player after Round 1, but can you blame me? I mean after two lacklustre JLT games his ‘pressure acts’ were the only positive trait he could put on a resume, reminding me very much of a low scoring taller forward option. Instead, he’s put up two solid scores to start the year and is forcing me to eat crow. I’ve said it before, I’ll say it again though a score in the 40’s is coming. Don’t panic, but take note. Last week for a portion of the Port game, Setterfield was playing a run with role containing Tom Rockliff. He increased his tackles, but he only recorded half the number of disposals he had in Round 1. Again, this doesn’t make him a popular trade out option, but if this trend continues next week, he’ll be justifiably moved down a rung. I don’t advise rolling the dice on Powell, but if you’re going to do it, this is the week. He backed up his ton with a respectable 74 against Freo, but these two scores came in games the Suns were right in the mix to win. I don’t expect Gold Coast to be this competitive all season long and as a result, Powell’s scores are bound to suffer. Those who took a chance on Schultz shouldn’t be too alarmed that his score nearly halved on the weekend. An average closer to the 50’s appears likely for the former Williamstown Seagull and he still has plenty of room to go, should he hold his spot of course. I’m worried. Gryan Miers looks like a great bench cash cow option for a long portion of the season, but the Quinton Narkle factor has me questioning his job security. He recorded 20 touches all over the deck and it’s hard to see Geelong making unforced changes to that dominant Cats team form a week ago. My gut just tells me Miers could be in strife, but as a cash cow I invested in I hope I’m wrong. Despite a goal of the year nomination Jack Petruccelle could find himself in the same boat as Miers this week. Andrew Gaff and Jamie Cripps are set to be included for the clash with Collingwood and it could be tough to squeeze the Eagles’ speedster into the fold. I think he deserves to be ahead of some other West Coast players in the pecking order, but I’m not on the Eagles selection committee. Nick Blakey lost money last week and he has only played two career games. Do I need to elaborate? See ya. The prospects for Jack Lukosius are a bit brighter, but he’s got to go as well. Just 83 points in two outings isn’t going to cut it and despite Gold Coast manufacturing plenty of shots on goal in the last fortnight, Lukosius has failed to have an impact on the scoreboard. A lot of coaches, myself included, would have moved Noah Balta (Tigers, $173K) on last weekend after he wasn’t named, but he may make his way straight back into the side. It’s not a formality, but with Jack Riewoldt now succumbing to injury as well as Alex Rance, Dimma Hardwick may opt to include his versatile tall in their side against the Giants. His teammate Callum Moore (Tigers, $170K) could be in the mix as well, but with a career average in the 40’s you couldn’t take the punt should he be named. Two midfielders are set to miss for Hawthorn, but the form of Mitchell Lewis (Hawks, $170K) could see him add to his two AFL game tally. Dumped Eagle Jarrod Brander (Eagles, $185K) will be one to watch in the next few weeks as the WAFL season kicks off and it’s worth noting that in the SANFL small forward Boyd Woodcock (Power, $170K) managed 20 touches and a goal, but is still a ways away from cracking the best 22. There are two clear favourites for the Cash Cow King this week in my opinion. Sam Walsh will have his moments throughout the season no doubt, but the Round 2 race comes down to Xavier Duursma and Charlie Constable. It’s tough to separate the first two fantasy tons of the cash cow season, but my vote slightly sides with Duurs. Who's gets your vote as the Cash Cow King for Round 2? I’ll be in a similar position. I think I’m leaning Gibbons against the Swans by a hair. When do we cash in the good rookies (Clark, Duursma, Setterfield, etc.)? Awesome question! The best answer is when their averages and scoring output is closer to their breakeven’s, so I wouldn’t be moving any of them yet, Setterfield is the closest of the bunch though. LDU? Is he to expensive? Not yet, but I don’t trust him to get 90’s each week, I’d back in one of the younger guns. Are Miers and Petrucelle traps given role and JS? Maybe not, it will be telling to see if they’re named this week should Narke and Cripps come in respectively. I like Miers over Petrucelle at this rate though. Feel free to shoot your rookie/cash cow questions through on Twitter at @SportsbyFry for me to answer in the article. If Twitter isn’t your preferred domain hit me up on Instagram or Facebook and I’ll get back to you as soon as I can. Good Luck for Round 3! Only issue on field is Witherden who may nto make BE (besides uber premos) but can’t afford to get him to Whitfield. Or maybe go early on Setterfield to Miers instead of Hore and then upgrade Witherden? Cheers Fry! Do I go Heeney to Boak? Don’t really like it cause I think Wines will affect his scoring and midfield time, but my other forwards are already Dangerfield, Kelly and Worpel. Or could go Burgess to forward line bench and get Whitfield but he is susceptible to the tag and that puts Parker on field in the forward line and Scrimshaw on the bench in backline. Thoughts? Same question, but I’m looking to replace Scott with LDU. Is it worth it? Thanks, Fry. If Scott plays I’ll keep him, and look to use that trade to upgrade Hore or Balta (unless they come back in- then I don’t know what I’ll do…). Good stuff again Fry, what do you think of moving on miers/scott to scrimshaw (JS). First trade means moving burgess forward and sitting scrimshaw at D7. Second trade means moving duursma to mids and benching walsh,constable or duursma. Scrim at D7. Who to field in F6 out of, Parker, petrucelle and Miers. Josh Rotham – what do you reckon Fry? Can’t find anything on him AF stats wise. Cheers Fry – that’s some serious inside info! I wouldn’t usually take that chance but I need $5K to get Dunkley to Boak and Hore is the obvious choice (everyone else on my team is playing). With no DPP option, it’s either Lockhart or Rotham. And Lockhart’s already shown he can’t score. Got all the good Rooks, so not that much of a risk really. Who’s a good bench replacement for Hore? whats you thoughts on trading Hore to Rozee?